Can you believe it’s 2015 already? I remember my mother telling me that the older I got the faster time would go and she wasn’t kidding. Along with a new year, I often see others making New Year’s Resolutions. This year, I started working on organizing and trying to eat better. I love eating salads, but really when I’m hungry I’d rather have something quick and easy then taking the time to assemble a salad. 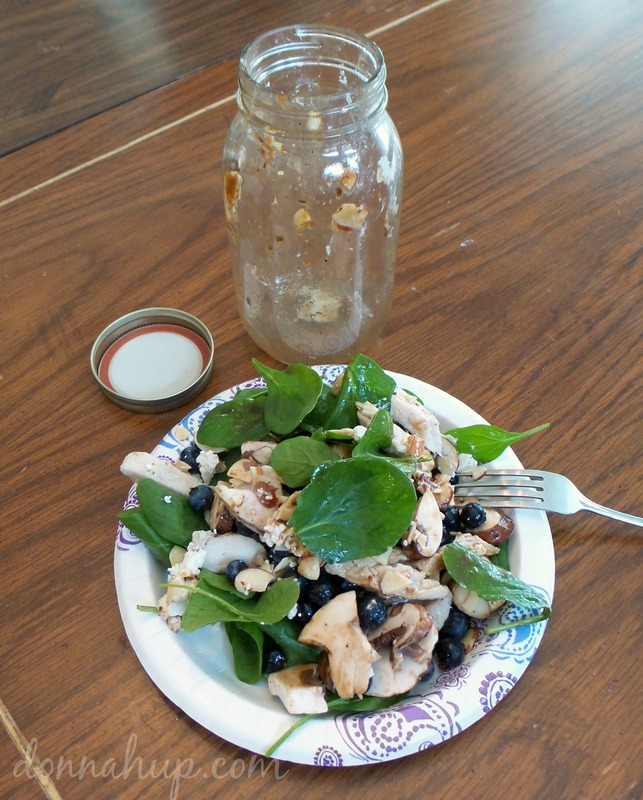 I had seen a lot of Mason Jar Salads going around on the internet and decided to give it a try. 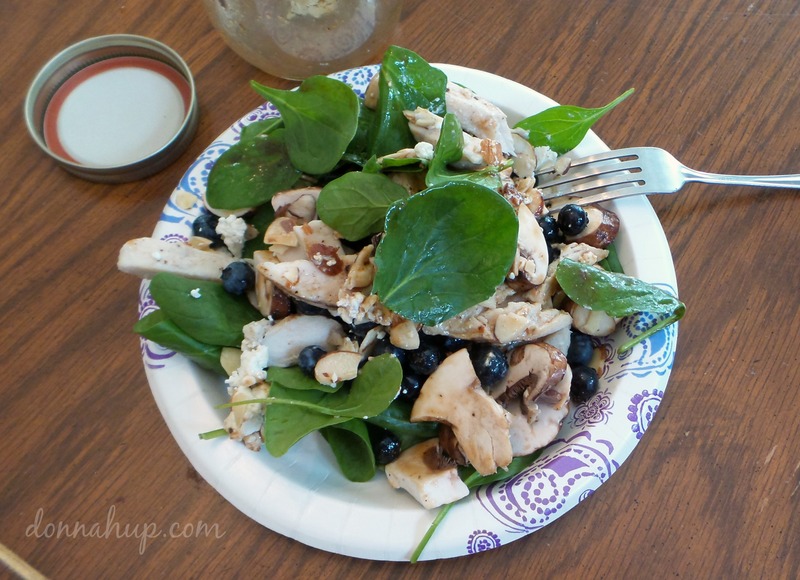 My inspiration was this Strawberry, Blueberry, and Spinach Salad. This is a great night-before idea for a healthy and fast alternative to a roadside fast food lunch stop when you’re in between destinations. The strawberries aren’t really in season for us in the north so I decided to make a few changes. When making the salad I started at the bottom with the balsamic vinaigrette. Next, I layered mushrooms, blueberries, and grilled chicken. I topped that with almonds and goat cheese. 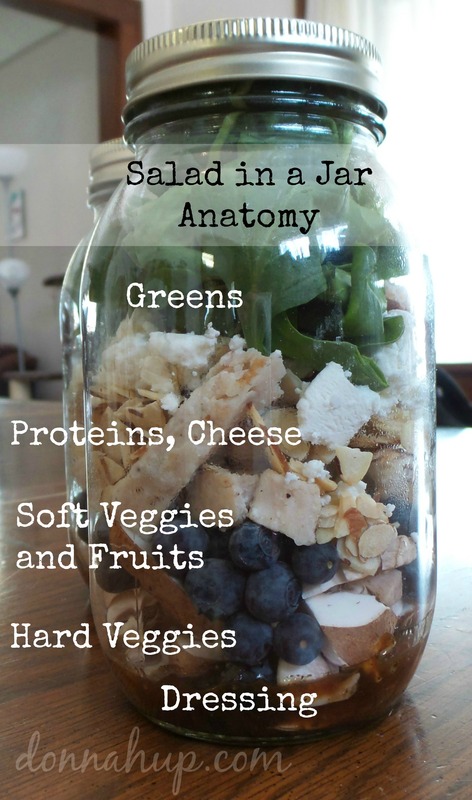 Then I just filled the remaining part of the jar with spinach. It was actually easiest to make the salad all at once. Storage was even easier in my tiny fridge. When I was ready to eat my salad, I just poured it onto the plate. I did have to use a fork to scoop some of it out but it’s pretty easy. Everything tasted fresh and I loved the way the salad dressing comes out on top of the salad. I really think this is a great idea and something I’ll be doing a lot more of! It’s not only easy to store, but you can grab it in go. I love opening my fridge to see these beautiful tasty jars! If you don’t want to carry the weight of the glass jars or worry about them breaking you can always use these Plastic Freezer Jars .